Has “Improve Onboarding Program” been on your perpetual to-do list? Are new employees getting a lackluster welcome when they join your organization? 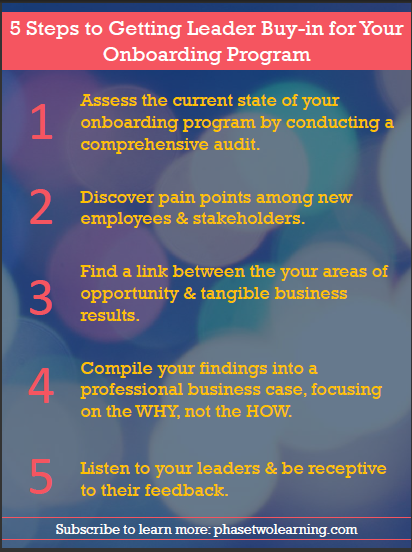 Ready to take your onboarding program to the next level, but you’re not sure where to begin? ⇒⇒⇒ No worries – we’ve got you covered! Successful organizations leverage the new employee experience as a competitive advantage and a driver of business results. The secret to getting there….to truly unlocking the results you’re seeking…is to find a link between onboarding and business goals and priorities. Finding that link, and communicating the strategic opportunity to your organization’s decision makers is the first step in getting their support to build (or rebuild!) your onboarding program. And we know that leaders will care about onboarding initiatives when we give them a reason to care about them. ⇒⇒⇒ To do that, you need to speak. their. language. When you’re ready to implement these five steps, check out the companion self-study kit!